When it comes to achieving a whole new look for your vehicle, an expensive and permanent paint job just isn’t always a practical or cost-effective solution compared to vinyl car wraps. If you’re thinking about transforming your vehicle’s appearance, a professionally installed car wrap can save you the costs and other disadvantages associated with a complete re-spray. At the end of the day, we all just want to get the best bang for our buck. While car wrapping is a great paint alternative, Sign Foundry’s professional team of car wrapping experts know it can be worrisome to get anything done to your car that may damage its Original Equipment Manufacturer (OEM) finish. With that in mind, we’re here to answer some of the most commonly asked questions vehicle owners have about vinyl car wraps below. A car wrap starts off as a large piece of adhesive vinyl film, which is available in a variety of styles and finishes. They generally consist of design elements such as images, graphics, photos, or other branding elements to make vehicles stand out from the crowd. What is the car wrapping process? First, the car wrapping team take measurements of your vehicle and create your car wrap design. Next, we produce your car’s vinyl film and laminate it (if it’s a printed design), protecting it from abrasions and UV rays. Finally, your car wrap is installed and applied to your vehicle. Does vinyl car wrap damage my paint? No, but improper installation or removal does! Here at Sign Foundry, we only use knifeless tape to carefully remove vinyl wraps, which means no blade ever comes in contact with your car when we do panel work. Car wraps can also be removed with no damage to your OEM paint (unless dodgy panel repairs have been done). Why is car wrapping better than custom paint? A custom car wrap is much cheaper, faster, and less permanent than custom paint. You’re also able to incorporate a greater number of design elements and colours into vinyl compared to getting a traditional paint job. The lifespan of a vinyl wrap can vary, depending on how well it’s maintained over the years. However, most car wraps generally last over five years. How do I maintain my car wrap? Make sure your car’s surface is cleaned frequently by hand, using water, mild soap, and non-abrasive sponges. This ensures your car wrap won’t get stained or damaged over time. What’s the difference between a cheap wrap and a premium wrap? Car wrapping is similar to other services in that, at the end of the day, you’ll get your money’s worth – whether you paid less or more. A cheap car wrap job “cuts corners” and can be easily identified by wrinkles or bubbles formed in the wrap. Debris trapped underneath the wrap appearing as dust spots, or worse, any damage to your paint, are all signs of a speedy, “cheap” car wrap job. What is the current paint condition like, is there any peeling or signs of oxidation? Are you after a solid colour wrap (we will need to confirm colour/finishes) or a digitally printed commercial wrap (need us to provide the design)? How far would you like the wrap to go – inside the door jams etc? We recommend calling past the Foundry, we can show you the range of films and discuss the process. When we are all on the same page we can provide a formal quote. Why should I choose Sign Foundry to wrap my vehicle? 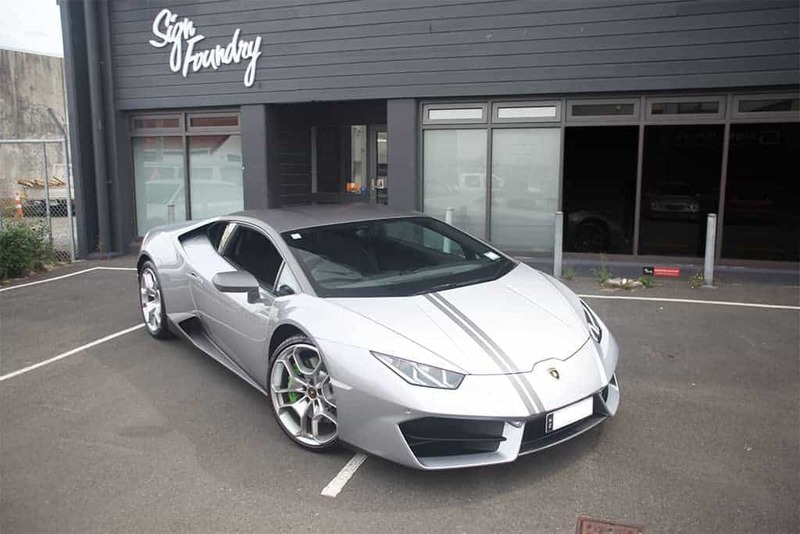 Here at Sign Foundry, we pride ourselves in providing the best-quality car wrapping in Wellington and Christchurch. While we might not be the cheapest, you’ll be hard-pressed to find another team of car wrap installers who will do a better job. We have been professionally trained by 3M and Avery (the manufacturers). Sign Foundry is proud to provide high-end vehicle car wrapping, with a sharp focus on precision, perfection, and customer satisfaction. Fill in our Car Wrapping Form or contact the team to find out how we can transform your vehicle.